The Bill Copeland Sports Centre is a state-of-the-art facility that has been hailed as a model for other community sports centres. Spacious, stylish and filled with natural light, it defies the usual image we have of a hockey arena. That’s because it’s much more than an arena. Visitors are struck by the executive-style appointments, the elegant interior design and the versatility of the building. The NHL regulation ice rink is lined with windows and features retractable seats and removable boards that transform it into a convention and trade show space. 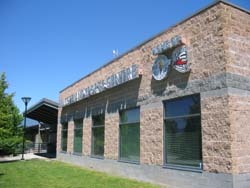 The centre is also connected to Burnaby Lake Arena so additional space is only steps away. The exceptional acoustic, lighting and sound systems make it ideal not only for large sporting events but also for concerts and graduation ceremonies. Seminar rooms that can accommodate both small and large gatherings are equipped with everything you need for a productive meeting. The sports centre is the anchor for the developing Burnaby Lake Sports Complex, already the site of playing fields, tennis courts, archery, rowing and equestrian facilities, an indoor pool and jogging track.